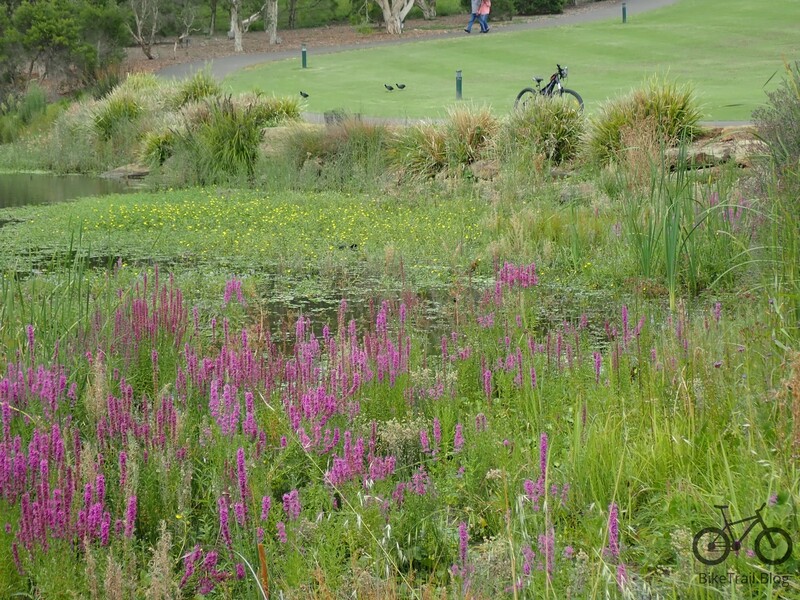 Six months ago my wife and I headed to Mt Annan and the Australian Botanical Gardens near Campbelltown. It was hot and the place was so dry, it looked like mars. We didn’t like the look of the roads as there was no verge on the narrow road and we tend to potter around. We rode a few of the pathways around the Café and these are quite steep. We got hot and gave up and headed to the café. I didn’t enjoy it and I didn’t write any story on it. Fast forward and I turned up with my eBike in January and decided to explore the suburbs of Mt Annan, Smeaton Grange, Harrington Park and Narellan. I arrived having little interest in riding around Mt Annan. But there had been a lot of rain and suddenly it was a lovely place. I headed of from the café and soon noticed a wonderful concrete shared path. I rode down that for a while and it came to an abrupt end. Funding must have run out. I left the park and headed for the suburbs. Of the features of the new suburbs is that they mostly have a network of bike trails. Most of the these go through the gullies between the housing or follow the bigger roads. They all seem to end up a high school or a community centre where you will usually find a way to easily cross the major roads. If you look at the path I followed, all the trails that are in purple are bike paths. Newer suburbs in Sydney make for fun recreational riding. The ride through Harrington Grove took a bit of map searching but the trails were fun. I ended up having a snack at Harrington Plaza. From there it was a quick turn around the lake and then I headed back into Narellan and through the shopping centre. I wound my way through numerous parks in Narellan Vale and back into Mt Annan, the suburb. Good fun with some decent climbing. Lucky I had the eBike, it was hot again. The tour around the suburbs was about 30km, you could do this with anyone though the hills around Mt Annan are a challenge. The ride around the botanical gardens on the one-way roads takes about 25 mins doing 20km an hour. And here the the older photos of Mt Annan in the Mars days of 2017 with some photos from my ride this January on the roads.